Welcome to our New Site - Give Us Your Feedback! 2 x 2.5" 3 x 4" 4 x 6" 5 x 7" 6.5 x 4 x 7" 7 x 9" 6 x 10" 8 x 11" 10 x 12"
Buy More Organza Sheer Bags Save More! 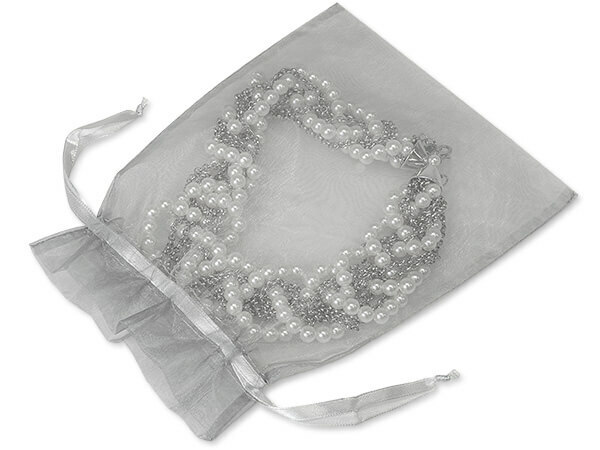 7x9" Silver (Gray or Grey) Organza Sheer Bags with coordinating satin drawstrings set approximately 1" from the top of the bag. 100% Nylon. Product ships as Dimensional Weight of LBS due to volume of carton ("x"x"). Organza bags are elegant, decorative & versatile. These sheer bags are ideal for basket stuffers, soaps, candles, sachets, jewelry, cosmetics, party favors and are excellent resale items. Bags are imported, 100% nylon and pvc free. Bags are hand sewn, colors and size may vary slightly from shipment to shipment.